We’re all Brilliant, if you stop and think for a moment. Seek those things which excite your mind and drive your emotions. Does it really matter what kind of job or responsibility you are tasked to perform? I say, no, because whatever it is fulfill it with passion and purpose, your effort will guide and place you towards your objective and your goal. An example: I believe we have all heard those stories, started out as cleaning up the business and now they’re running it. It happens everyday, but we must find and understand are strengths and weakness, focusing on your strengths and listening very carefully and seek those individuals which are excelling and overachiever at the skill set you desire. If your aspiration is working with numbers or accounting seek it out, because its out there. Be brilliant in what you excel at, the sacrifice must be made to bring you happiness and overcoming a lost sense of hopelessness. The hardest part is figuring out, what job to take. Why, because what you excel at your truly going to shine. Stop and think for a moment, about the times when you were growing up and the wonderful thoughts we had. It’s never to late and every second counts. I sit here and write to help those see what I’d seen and how amazing it made me feel. No task or job is difficult if you effort and heart are correct. Mind and spirit will bring out the brilliant you, and those around you will to be affected. Today sounds like a good time to begin, remember what will make you happy in the long run is the ticket to success. My thoughts never stop, sometimes I believe, I never turn off. I drive myself crazy, and I also think God is telling me to reach out to those with a message of goodwill and hope that things will get better. 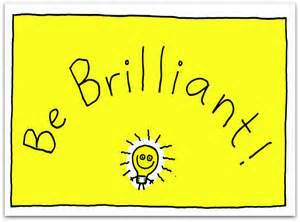 Brilliant is to be, exceptionally clever or talented. Those are the very words we should memories in our hearts. Be brilliant and seek those and connect yourself in their circle of friendship. Great minds think alike, and this is so true. It’s our time and never listen to anyone else, just do the things which drives your emotions. There are no rearview mirror in life, only what is in front of you. Inspiration and your guiding light will prevail and boosting yourself esteem is the food your body needs. There is another word that comes to mind, clever; quick to understand or learn. So be clever and apply those ideas and talents we all possess. It’s clear and understood it takes some strategy and planing on your part. No magic or waking up and “BAM” it happened. Hard work is required, and you already know what makes your engine run faster than ever before. It’s what you excel in, and what creates the spark you have been looking for. We’d used these terms, firing on all cylinders and feeling like a million bucks. Don’t look outside yourself, because its inside and it’s been there since your first breath of air was taken. Be you, because God made everyone special and unique. So stop complaining and start doing something about it, nothing will ever happen until you start taking full responsibility for your actions. If you’re not happy change it and find it, stop looking for excuses and blaming everyone else for where you are. You have the ability and talents to succeed, its right in front of you find the closes mirror and it right there. You can, I believe and God believes we all have a purpose don’t waste it, Be Brilliant. This entry was posted in Uncategorized and tagged Brilliant. Bookmark the permalink.